In Office42, you’ll be able to find calendars in all shapes and sizes, such as company and department calendars, team and individual employee calendars, etc. Calendars can be shared which will make your work much easier as you’ll be able to see the schedules and working plans for any department, workgroup or individual employee. These calendars are also interactive and easy to use, and come with a built-in scheduler which provides quick and convenient scheduling of people and meeting rooms and managers invitations and further notifications. 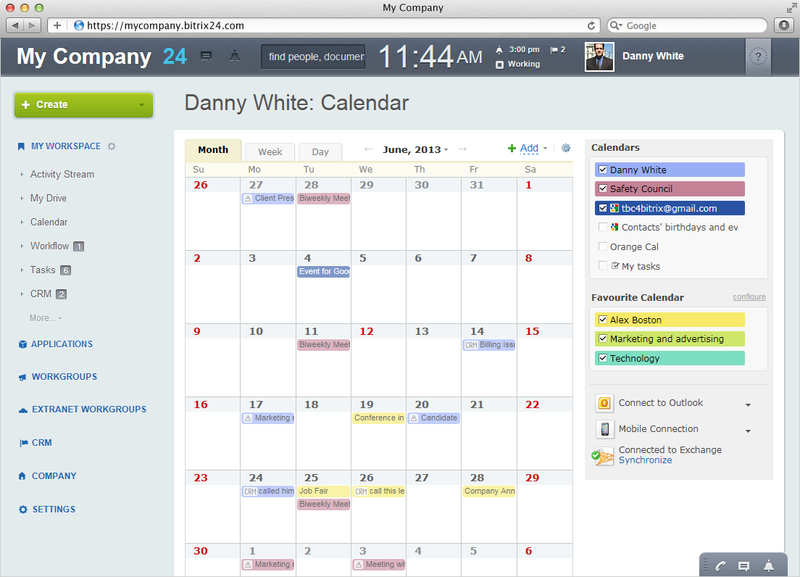 Calendars of Office42 are fully customizable and can be either public or private, with flexible permission and visibility settings. For example, when an important merger or acquisition meeting is scheduled, calendars of the executives involved will display that they are unavailable during the meeting time without divulging any sensitive information about the nature of the meeting to any employee without proper access level. In addition, it is possible to create entirely private events that neither supervisors nor subordinates can view. 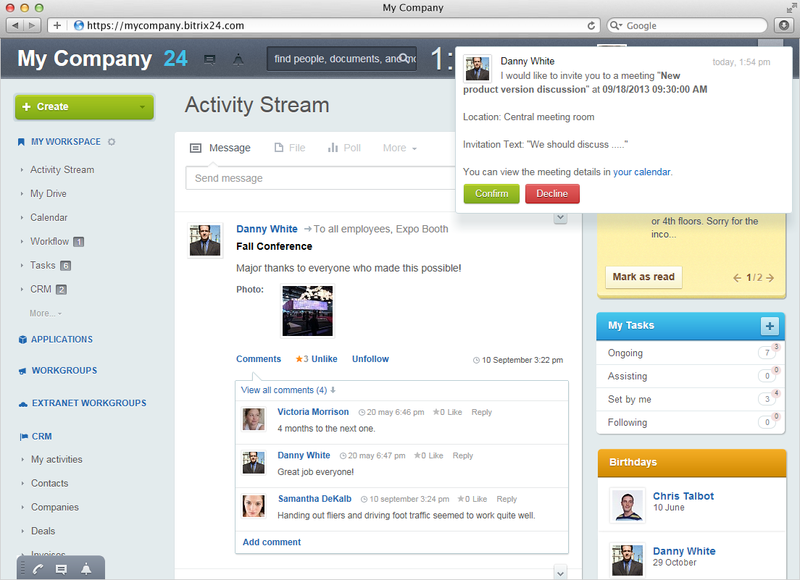 As we said, Office42 automatically sends notifications of individual or group events for everyone who is involved. When an event is scheduled, each participant will receive a notification where they can confirm or decline their attendance. The event gets automatically scheduled in a team/workgroup/department calendar, as well as the calendar of every individual employee who confirms participation. Calendar subscription option (called Favorite calendars) is another great feature, allowing display of any group or personal calendar to be shown on a user’s profile calendar. This option is especially handy for executive assistants, office managers and secretaries, who have to keep track of meetings and appointments of others and who often assist with scheduling. Repeating events (weekly meetings or daily gym exercise, for instance) can also be scheduled with special alerts sent to remind of the planned activity. 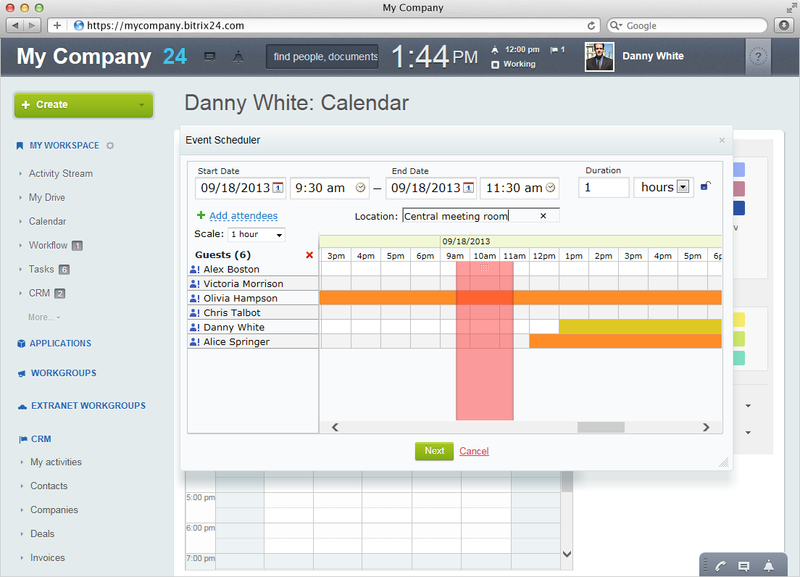 Also, Office42 calendars are integrated and automatically sync with Office42 employee leave management system. You can also synchronize your external calendars (Outlook, Exchange, Google Calendar, CalDAV, iCal, etc.) with the calendars of Office42. This comes really handy when each employee or team member uses their own calendar and there is no easy way to share these. Office42 Calendars work on any iOS or Android mobile device. 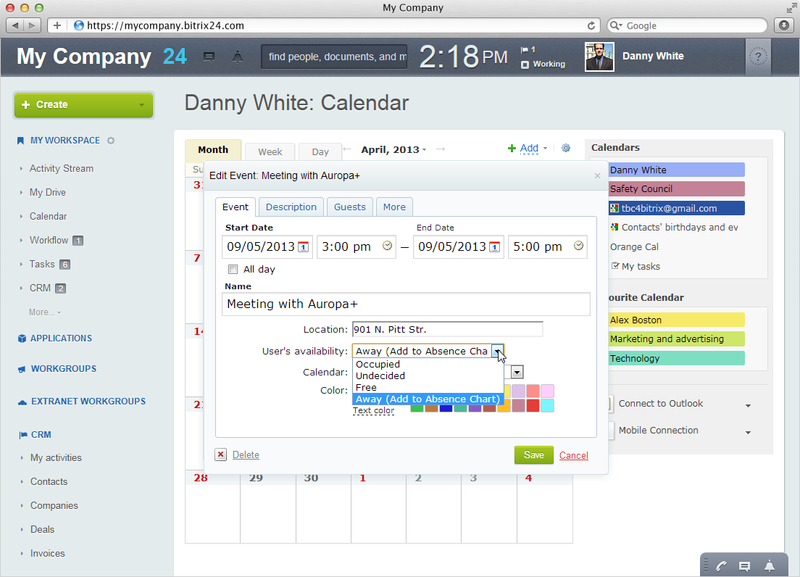 In addition, Office42 Calendar can be used to schedule virtual meetings, webinars and conference calls. WebRTC based video chat is automatically available at no additional charge to any Office42 user, doesn’t require installation and works on any personal computers equipped with a webcam.